FRESNO, Calif. - The Fresno Grizzlies announced they will co-present the inaugural Grizzly Music and Arts Festival with Heineken USA on Saturday, May 16th at Chukchansi Park. Fresno native Fashawn, Brooklyn indie-rockers Delta Spirit, Iamsu!, Ty Segall's FUZZ, and Kool John lead a lineup of over 15 acts in a festival that also features a skate demo, carnival games, vendor booths featuring local artists, and local food trucks. The current music lineup includes Fashawn, Delta Spirit, Iamsu!, Ty Segall's FUZZ, Kool John, Strange Vine, Lou Umbra, Omar Aura, Clouded Vision, 40 Watt Hype, Sahab, Exile, The Kid Ryan, Zee Will and Slow Season. General admission tickets are available for $10 online or at the Chukchansi Park Box Office. Anyone purchasing a GA ticket will also receive a ticket voucher for a future Triple-A Fresno Grizzlies baseball game. With the recent addition of MLB.com No. 3 overall prospect Carlos Correa, the Grizzlies boast one of the more talented teams in Minor League Baseball. VIP packages, priced at $30, are also available and include meet-and-greet opportunities with artists in the air-conditioned Phoenix Club, a commemorative artist pin set, and an exclusive viewing area close to the stage. Fashawn, who headlines the inaugural Grizzly Fest says, "I want to give back to the community that's been so good to me. Fresno has needed a landmark music and arts festival to raise awareness for all the talent that is located in the Central Valley. My thanks to the Grizzlies for taking the lead on putting this festival together." "For the evolution of the Grizzlies brand, it's important for us to stretch over to non-baseball events," stated Sam Hansen, Grizzlies Director of Marketing. "Triple-A Baseball will always be at the core of what this organization is about, but recruiting and hosting an event such as a music and arts festival embodies the direction of where we're heading. We want to make sure we're loyal to Fresno in everything we do." Gates to Chukchansi Park open at 2:00 p.m. on the day of the event, with parking available in the H Street Lot for $6. 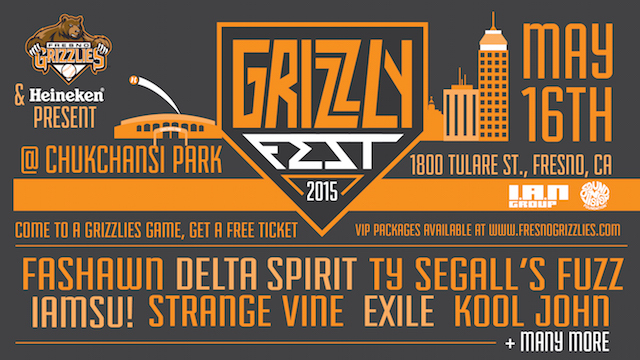 Interested vendors can contact Jon Stockton at jstockton@fresnogrizzlies.com for information and pricing.